Protect pets from the environment with this convenient and stylish Pet Gear® Home 'N Go Pet Pen. This uniquely designed pen features an open top to provide interaction between pets and their owners. This Pet Gear pet pen is simply unique. 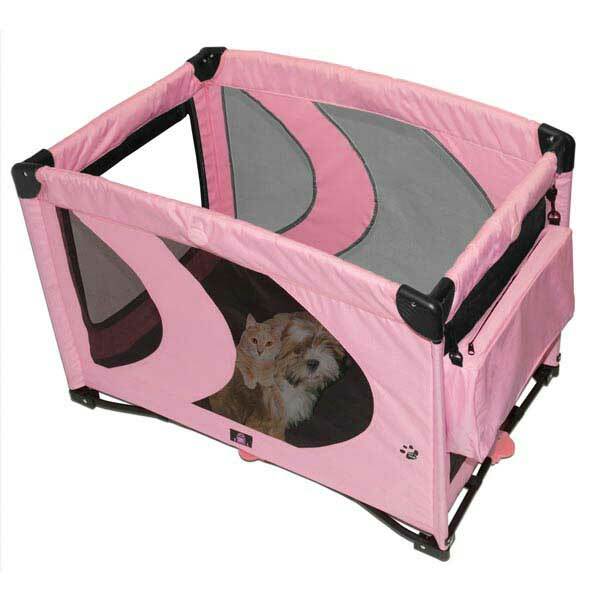 Its spacious design ensures that your furry friend is comfortable, yet its zipper door still keeps your pet contained. Plus, the open top encourages interaction, preventing your pet from feeling lonely. Front zipper door allows for easy accessibility. Waterproof mat simplifies cleanup after accidents. Removable fleece pad provides comfort. Storage pockets hold toys, treats and other essentials. The unit easily folds down for travel and storage and has a removable fleece pad and waterproof liner for easy cleaning. Storage pouches help hold brushes, toys and anything else pet needs. Available in Blue Sky and Pink Ice styles. Product Weight: This product weighs approximately 17 lbs. Shipping Info: This item is shipped directly from the manufacturer. ©2019 Puppydog Boutique. All rights reserved.